Agrav. It was the century’s most important advance in space travel…and an experiment so revolutionary that only the men who huddled beneath the surface of Jupiter Nine were permitted to know its full meaning. Yet someone else did know—knew everything, saw everything, heard everything—and was diabolically sabotaging the top-secret mission. Who or what the enemy was, Lucky Starr didn’t know. But one thing was certain. The deadly force was not human…not even remotely human! 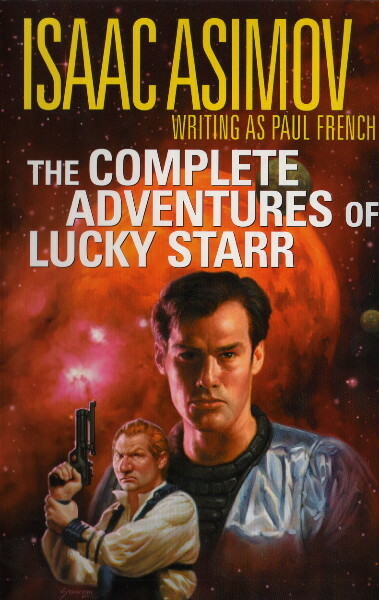 For some reason, this may be my favorite of the Lucky Starr books. The further and further into the series that Asimov gets, the farther and farther he gets from the unsophisticated television programs such as the books were supposed to inspire. Granted, we still have some stereotypes here hanging on (Red Summers, for example, the stock scowling villain), and a few instances of fisticuffs to satisfy the action fans, but much of the rest of the story is more complex and interesting than we have seen before. The characters do not stand out, particularly, but the plot and sequence of events is an improvement. In particular, the use of a positronic robot with a nicely subtle analysis of the Three Laws was well-done. This story is memorable for one other thing. 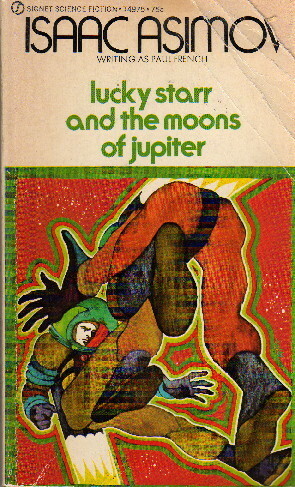 When the Lucky Starr books were reissued in the 1970’s, for the first time under Asimov’s own name, three of them acquired forewords from Asimov explaining how planetary science had in the course of its development made hash of the stories, and hoping that the reader could enjoy the stories nonetheless—Mars had craters, not fissures, Mercury didn’t actually keep one side facing the sun, and there were no planetary oceans (or any oceans at all) on Venus. Ironically, planetary science has continued to make hash of Asimov’s stories. Pirates of the Asteroids and Rings of Saturn come through moderately intact, but Moons of Jupiter has to be added to the list of casualties. Much of the story takes place, after all, on the large moon Io. Not much was known about Io in the 1950’s—or, for that matter, in the 1970’s—but thanks to the Voyager and other probes, Io is now known moderately well, and comes nowhere close to matching Asimov’s description. And yet I cannot help but think it a shame that the real Io was not known in 1957. It would have made for an even more dramatic setting than the one from Asimov’s imagination.